The all-new 2014 Corolla will include dramatically amplified elements of style, design, quality and craftsmanship while building a upon the stellar Corolla reputation for reliability, efficiency and function, making Toyota’s newest compact the most surprising and capable Corolla yet. The Corolla is the best-selling car nameplate on the planet and this year marks the Toyota Corolla’s 47th year on the market. Since the Corolla first appeared in Japan in 1966, Corolla has played a major role in the motorization of Japan, and has sold in such volume impact transportation in rest of the world. The global scope of Corolla now finds it manufactured in 16 locations and sold in 154 countries. The Toyota Corolla’s global appeal as a global car is rooted in a product philosophy set forth by Tatsuo Hasegawa, the first Corolla’s chief engineer, who sought to develop “a car that brings happiness and well-being to people around the world”. As a result of more than 40 years on the market satisfying consumer needs, this compact car has developed into a pillar supporting Toyota’s famed reputation for dependability, quality, and reliability. The Corolla, maybe more so than any other Toyota sold globally, has been the answer for consumers in the market for a reliable, efficient, and affordable compact vehicle. In developing this new 11th generation of Corolla, Toyota designer and engineers relied on exhaustive consumer feedback to help shape key elements of the product on a global scale. Customers emphasized the overwhelming importance of vehicle design on product perception in the marketplace. The all-new 11th generation Corolla makes a much stronger design statement with more compelling exterior and interior executions that challenge the pre-conceptions about Corolla. The next generation Corolla continues the Toyota brand’s recent momentum set forth by design-focused product launches such as Avalon and RAV4. The 2014 Corolla will remain appealing to the current consumers while helping the world’s most popular car grow in appeal with youthful car buyers. The all-new Corolla makes an immediate visual impact with a more expressive, chiseled exterior design that elaborates on the “Iconic Dynamism” theme first seen in the Corolla Furia Concept that debuted at the North American International Auto Show. The new Corolla is distinguished by its tauter, more athletic proportions that ride on a longer wheelbase (+ 3.93 inches/ +100 mm compared to current model). With the wheels pushed out toward the corners, compact overhangs, and more tapered front and rear expression, the new Corolla communicates a more dynamic compact sedan form, even at a standstill. The new sedan is 3.90 inches (99 mm) longer overall and yet presents a more compact appearance than the current model thanks to a basic shape that tapers at the front and rear of the vehicle to help emphasize the wheel arches, and wheels-to-the-corner stance. The new Corolla features an expressive fascia with sharper, more pronounced details above a large trapezoidal grill that rests beneath a thin intake inlet below the hood. A frontal view of the new Corolla reveals a continuation of the design themes seen in recent Toyota sedans such as Camry and Avalon, and creates a sleeker, more assertive impression of a Toyota compact sedan with its more precisely sculpted surfaces. Among the challenges presented by the new Corolla’s original design concept was the need to execute more deeply rounded corners to achieve the desired sleeker image. The thick structure of conventional headlamps would hinder the appearance of deeply rounded corners. 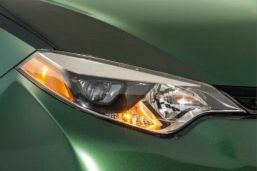 Sleek, compact LED lamp assemblies were adopted to reduce the corner mass, and help accentuate the Corolla’s tapered, rounded-corner, front- end design theme. In addition, the low heat generated by the LED lamp enabled the use of a lighter weight PES resin lens instead of conventional glass. Corolla is the first compact sedan to offer standard equipped LED headlamps. Heightening the exterior design’s attention to detail, the new Corolla’s athletic profile reveals door handles that have been sculpted into the body to align with a character line that spans the length the door surfaces utilizing a vertically asymmetrical door handle design. 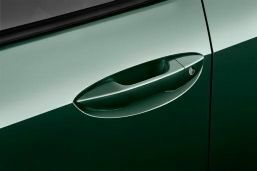 The new Corolla’s C-pillar features a “faster”, longer sloping angle that blends in to the rear deck more athletically. The rear view is highlighted by large, sharply-sculpted rear taillight assemblies. The new Corolla is available with a subtle rear deck-lid spoiler that accentuates the sportier nature of this new compact. The new Corolla’s interior continues the “Iconic Dynamism” theme to create a stylish, highly functional and inviting interior space with a greater sense of craftsmanship in its design, use of materials, and attention to detail. A horizontally oriented dash structure helps enhance the interior’s sense of spaciousness while providing a more wide-open intuitively functional space for interface with vehicle controls. The interior offers a premium aesthetic with its use of piano-black gloss trim highlighted by metallic ornamentation and trim that helps convey a more upscale yet sportier image. Depending on the interior colour theme, blue, black or amber pinstriped accents are used in conjunction with the dash and door panel ornamentation to enhance the premium appeal of the interior. Ornamental stitching along the leading edge of the dash pad helps add a sense of craftsmanship to the interior’s upscale nature. An available decorative boot with ornamental stitching surrounding the shift lever adds a sporty, premium look. As a result of the 3.93 inch (100 mm) increase in vehicle wheelbase, the new Corolla’s interior package has been dramatically improved in terms of passenger comfort, gaining considerable legroom for the rear seat occupants. Compared to the outgoing model, the rear seat hip point has been moved back 2.95 inches (75 mm) and additional leg room was gained by adopting a slim front seat back. The rear passenger floor was made flatter by re-routing exhaust pipes beneath the vehicle to offer better middle position foot room. Rear seat comfort is also enhanced with the use of denser urethane pads and foam inserts within the seats. 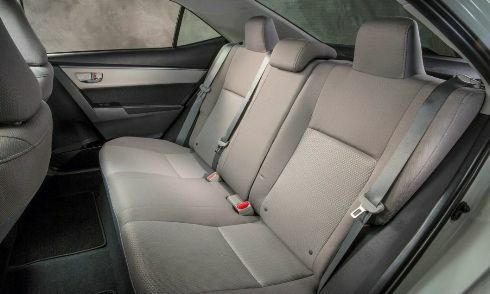 The 2014 Corolla elevates the compact car’s interior experience by treating occupants to a high level of cabin quietness. Environmental noise, in addition to road and engine sounds entering the cabin, are mitigated by an acoustic glass windshield, improved floor carpet insulation, an instrument panel seal between the cowl and the windshield, a fender sound insulator, and an inner dash inner silencer pad. Corolla’s front seats include a longer, more supportive lower cushion and an improved bolster design while offering a 0.59 inch (15 mm) increase in the seat’s range of adjustment to help accommodate a wider range of physiques. The effort required to operate the Corolla’s front seat slide, recline, and lift mechanisms has also been greatly reduced. Corolla’s standard gauge cluster offers three dials with sharp image detail and clear blue illumination, surrounded by chrome trimmed rings. Within the speedometer dial is a multi-information display that shows odometer, trip odometer, current fuel consumption, average fuel consumption, cruising distance and average vehicle speed. The S-grade meter cluster offers a high technology feel with a 3.5-inch TFT display that rests between two large dials. The new Corolla offers an expanded range of interior choices with seat fabrics that create an appealing contrast with the piano black and metallic-accent surfaces. Depending on the Corolla trim level, the seating surfaces are trimmed in premium, detailed fabric or a durable SofTex material. The 2014 Corolla is available in four distinct grades: CE, LE, S, and the new ECO grade. While each grade offers its own equipment level, all Corollas feature LED headlamps with LED daytime running lights, a glass imprinted AM/FM antenna, colour-keyed door handles, colour-keyed outside mirrors, a 60/40 split fold-down rear seat, power door locks with automatic locking feature, power windows with driver-side one-touch up/down, and eight airbags. The Corolla CE model is offered in two configurations (6-speed manual or 4-speed automatic) with 15-inch steel wheels. The Corolla CE ‘s audio is equipped with AM/FM CD with MP3 Player, Auto Sound levelizer (ASL), 4 speakers, auxiliary audio jack, USB audio input and Bluetooth Capability. The Corolla LE is the next model in the grade strategy which offers available fog lamps and power tilt/slide moonroof, colour keyed heated power mirrors, variable intermittent wipers, 16-inch steel wheels with full wheel covers, integrated back up camera, audio system with a 6.1-inch display screen with voice recognition and 6 speakers. A new Continuously Variable Transmission with intelligent shift is the transaxle available on the Corolla LE. The Corolla S lends a sportier identity to this compact sedan with its rear lip spoiler, and offering stylish 17-inch aluminum alloy wheels, tuned suspension, a chrome-tipped exhaust, sports instrumentation with LED colour-illuminated speedometer and tachometer flanking a 3.5-inch TFT colour screen, offered in either a 6-speed manual or CVTi-S (continuously variable transmission Intelligent shift). The Corolla ECO is a new trim level that elevates the fuel economy of the new sedan with the help of aerodynamic underbody covers, colour-keyed rear spoiler, a more efficient 1.8-liter engine with VALVEMATIC technology, low rolling resistance tires on 15-inch wheels, or available 16-inch aerodynamic alloy wheels, and efficient CVTi-S.
Other popular features available for Corolla’s trim levels include Smart Key System on front doors and trunk with Push Button Start, auto air-conditioning with pollen filter, leather-trimmed tilt/telescopic 3-spoke steering wheel with paddle shifters and audio, Multi-Information Display, Bluetooth, and SofTex-trimmed heated front seats. Much more information and details about the new Corolla’s trim levels and specification will be made available closer to on-sale timing in the fall. The Corolla has always prioritized delivering outstanding fuel economy and the new 2014 model maintains that focus. The Corolla ECO is a new grade that enhances the fuel economy with the help of aerodynamic underbody covers, colour-keyed rear spoiler, a more efficient 1.8-litre engine with VAVLEMATIC technology, low rolling resistance tires on 15-inch wheels or available 16-inch aerodynamic alloy wheels, and an efficient CVT. Efforts to reduce wind resistance have helped the new Corolla achieve a drag coefficient of .28, which places it near the top of the compact-sedan class. Careful attention has been taken to refine airflow and reduce turbulence over the front and rear edges of the car. The Corolla’s underbody features a flatter, smoother design to help reduce turbulent airflow. The ECO-grade, and S-grade models offer strategically placed vehicle under covers located below the bumper fascia, engine, front floor, rear floor, and fuel tank to help manage airflow under the vehicle for improved efficiency. The 2014 Corolla offers two efficient 1.8-liter four-cylinder engines. The base 1.8-liter with VVT-i engine is available on the CE, LE, and S grades and is rated at 132 horsepower. The Corolla’s new ECO trim level is equipped with a 1.8-liter engine with VALVEMATIC , a valve train technology which appears for the first time in North America with Corolla. VAVLEMATIC offers a broader range of continuously variable valve adjustment (lift and phasing) to provide optimal intake valve (not on exhaust side) relative to engine demands. VALVEMATIC is applied to the intake side of the engine that offers an improvement in fuel economy and engine output (140 hp). 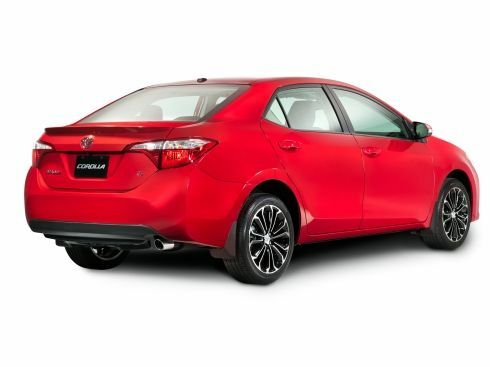 The 2014 Corolla also offers improved fuel economy thanks to its advanced Continuously Variable Transmission. This CVTi-S (I for intelligent, S for shift), which will be available on the LE, S, and ECO Corolla models, features several enhancements to improve its efficiency and help create a driving sensation more similar to a traditional hydraulic automatic transmission. 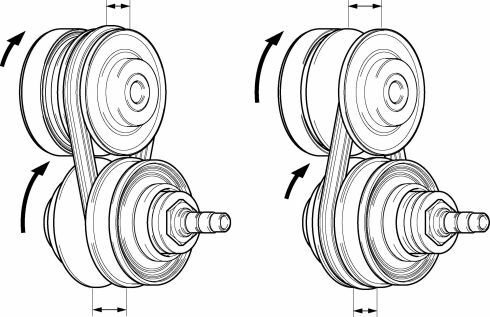 While the efficiency and reduced weight inherent in a pulley-type CVT would seem an ideal solution for vehicles emphasizing fuel-efficiency, the characteristic CVT “rubber band” driving sensation of the engine winding to its power band upon acceleration has earned detractors. With Corolla new CVTi-S, Toyota’s engineers improved the drivability of the new Corolla by adapting 7 stepped “gears” or shift points into acceleration and deceleration curves. The Corolla’s new CVTi-S even mimics the familiar characteristics of hydraulic automatics creating a sense of positive shift engagement. Shift-point changes can also be manually actuated from the shift gate or steering wheel paddle shifters on the Corolla S trim level. As the first pulley-style CVT product offered by Toyota in North America, the engineering effort prioritized making the new CVTi-S’ operation and power application more appealing and familiar to North American drivers. Corolla’s engineers maximized the fuel saving design inherent in a pulley CVT while enhancing its operation to provide a more “direct feel” to pedal inputs through careful analysis of traditional automatic transmission operation. The new CVTi-S will provide a more linear connection between pedal effort and acceleration feel compared to previous CVT designs. Toyota engineers addressed challenges presented by typical CVT design such as the high level of hydraulic pressure CVT’s require for operation, and the optimization of pulley ratio range to offer the best performance and fuel economy. Typically, CVT hydraulic fluid pumps are driven at the same rate as engine speed; as a result, the pump wastes considerable effort, hurting transmission efficiency at higher engine speeds as the pump moves more fluid than necessary to lubricate and clamp the CVT’s belt. With this new CVTi-S, hydraulic pressure was reduced to an optimal point to protect against belt slippage, while conserving drive effort to limit excess pumping losses. The Corolla’s new CVTi-S is fitted with an oil pump that features a coaxial 2-port design that enables a 25% reduction in pump drive torque compared to other pump designs, and results in a greater efficiency with its reduction in parasitic engine loss. For a belt-driven CVT, the range of speed ratios is determined by the diameters of the input and output pulleys. The greater the disparity in size between these two pulleys, the greater range of gear ratios, efficiency and performance the transmission can offer. 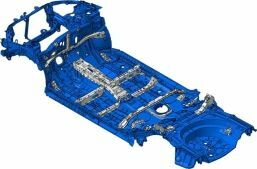 The clearances within the Corolla’s CVTi-S exterior casing and between internal components have been enhanced to better accommodate the most optimally sized pulleys within the compact transmission case. The CVTi-S offers a forward gear ratio range of 0.396 to 2.480 which works well for acceleration, cruising speeds, and fuel-conscious driving with a 4.761 final drive ratio. The new CVTi-S includes a transmission fluid warmer that is used to help get the fluid to its optimal temperature faster. The Corolla’s new CVT maximizes the difference between the pulley sizes without an increase in the size of exterior case to achieve a speed ratio range of 6.3 which helps both fuel efficiency and acceleration. The Corolla’s new CVTi-S uses a lower viscosity CVT fluid that protects all of the transmission’s internal parts while helping reduce parasitic loss to enhance efficiency and performance. The CVTi-S also offers extremely quiet operation from a compact, lightweight case design that adds reinforcing ribs and an optimal shape to help suppress vibration and noise. Corolla’s CVTi-S-equipped models offer either an ECO, or a SPORT mode. With ECO-mode, the accelerator control becomes non-linear to suppress the vehicle’s response to choppy driving and contain acceleration from a standing start to help reduce fuel consumption. The accelerator pedal’s communication is the same as Normal-mode after 50% throttle. In ECO-mode, the air conditioning operation is controlled in the interest of efficiency with compressor power reduced, the utilization of recirculation mode, and extended time allotted to attain a desired interior cabin temperature. The Corolla S CVTi-S offers a Sport-mode that helps deliver a more dynamic driving experience with software tuning that alters shift points, creating transmission behavior during acceleration that enhances the sporty character of the S-grade. Sport mode is not a track focused mode, but rather a transmission setting that, along with unique electric power steering programming, helps create a sportier driving sensation during normal road and highway driving. The new CVTi-S’ 7-speed sport sequential shiftmatic mode can be actuated through steering wheel mounted paddle shifters or the shift gate. A plus or minus symbol in the gate allows drivers to make fast, sequential, stepped shifts to help enhance the driving experience. The Corolla S console shifter also offers a manual shift gate (M position) that allows drivers to make brisk upshifts or downshifts using the shift lever. The shift step will automatically be engaged if the engine revolutions become high enough or down shifted if they become low enough. The M modeactivity is displayed in the display of the Corolla S combination meter. The Corolla’s Sport mode was developed and evaluated on roads within the key global markets to help ensure a more energetic drive across a broad range of conditions. The base model Corolla CE is offered with a 4-speed automatic transmission or a 6-speed manual transmission. The 6-speed manual is also available in the Corolla S.
The new Corolla offers improved handling and steering thanks to a rigid unibody that can take advantage of improved suspension tuning to offer a more engaging, better handling, more dynamic car. The Corolla’s unibody makes extensive use of high-strength steel to improve the rigidity of the structure, but also keeps vehicle curb weight under 2900 lbs. for all grades which helps fuel efficiency. The use of high tensile strength steel allows for reduced thickness, and optimized shape of structural panels while increasing strength to help improve collision performance. Corolla is expected to perform very well in the collision safety ratings test. The new Corolla features additional unibody bracing (tunnel brace and rear floor brace) to help increase platform rigidity over the current model. Key underbody and floor pan bracing help improve the Corolla platform’s structural rigidity. The new Corolla’s suspension uses a Macpherson strut design for the front with a new, more rigid control arm design. A rear torsion beam arrangement is used for the rear. Both suspension layouts have been designed to take advantage of the additional body rigidity to provide improved handling responses and steering control. While the spring rates on Corolla have been optimized for ride comfort, the S-model features unique coil, damper, and bushing tuning to help offer a sportier driving characteristic. The rear torsion beam’s attachments points are now fastened to the body at a slanted, diagonal angle for its bushings as opposed to the straight attachment orientation of the previous generation vehicle. This diagonal attachment point layout contributes to improved rear handling, grip, and stability. The new Corolla is equipped with an electric power steering system that offers enhanced feel and ‘weight” in the hands of drivers, while increasing its sense of directness with little effort. The use of an electric rack and pinion system eliminates an accessory driven hydraulic steering system, which would represent parasitic loss to the engine. The lightweight and compact components of the tilt, telescopic steering structure are designed to help enhance steering rigidity, while reducing vibration. A more structurally rigid steering intermediate shaft helps improve the directness of the new Corolla’s steering. The new Corolla’s steering measures 3.19 turns from lock to lock. The braking system includes a 10.8 inch (275 mm) ventilated disc up front and either a 10.2 inch (259 mm) solid rear disc (available on S-grade) or standard 9-inch (229 mm) rear drum. Like all Toyota models, the 2014 Corolla will feature Toyota’s Star Safety System standard, which includes Vehicle Stability Control (VSC), Traction Control (TRAC), Anti-lock Braking System (ABS), Electronic Brake Force Distribution (EBD)and Brake Assist. It also features the standard Smart Stop Technology brake-override system, and an electronic tire pressure monitoring system as standard equipment.